The first thing you'll notice when you walk into Levittown Dental Group is the incredibly friendly and inviting atmosphere. Members of our staff have been hand-picked to provide you the best possible experience during your visit to the dentist. Learn more about our team below. 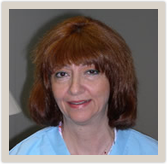 Iris has an associate degree in Dental Hygiene and has over 27 years of experience, 23 of those years are with Dr. Malkin. She is certified to deliver nitrous oxide (sweetair) and infiltration analgesia. Along with her regular duties, Iris also performs the whitening procedures. On Mondays Iris works with our periodontist, Dr. Ahuja, and performs the cleanings. Iris keeps her license current by taking continuing education classes. This keeps her up to date on the latest information regarding patient health.